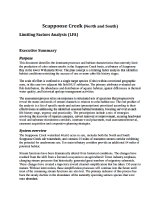 These two documents identify the dominant processes and habitat characteristics that currently limit the production of coho salmon smolts in the Scappoose Creek basin and in Milton Creek. The concept of these plans is a limiting factor analysis, identifying habitat conditions that restrict the success of one or more coho life history stages. Milton Creek was historically a direct tributary to the Columbia river, and currently a watershed draining into the Scappoose Bay. The sub-basin comprises of 21,561 acres and contains 17.8 miles of mainstem stream corridor and 6.6 miles within five tributary corridors utilized by coho. Spawning gravels are very low in the upper mainstem of Milton Cr, suggesting that restoration prescriptions for this important segment of the Core Area should focus on improving trapping and sorting activities that boost gravel retention and functionality. These changes would allow currently functional summer and winter habitats to be adequately seeded. Elevated temperatures in the lower mainstem Milton Cr make this otherwise high-quality habitat unusable during the summer. Coho juveniles attempting to migrate upstream to cooler tributary systems encounter multiple physical barriers. Those that migrate downstream face temperature limitations beyond their physiological threshold and must move or perish. From a restoration standpoint, the most effective approach to deal with this highly important habitat disconnection is to work simultaneously in both the mainstem and Cox Cr. Scappoose Creek is a tributary of Scappoose Bay in the lower Willamette River. The Scappoose Creek watershed is 40,663 acres and includes both the North and South Scappoose Creek sub watersheds, and contains 25 miles of mainstem stream corridor exhibiting the potential for anadromous use. Ten main tributary corridors provide an additional 14 miles of potential habitat. The loss of beaver colonies. In a 2008 survey, only 24 beaver dams found in the entire Scappoose watershed’s 39 stream miles of anadromous salmonid distribution. Spawning gravels are very low in Cedar Cr suggesting that restoration prescriptions for this important segment of the Core Area should focus on improving trapping and sorting activities that boost gravel retention and functionality. These changes would allow currently functional summer and winter habitats to be adequately seeded.